We encourage you to bring your camera. Take as many photos as you'd like, and share them with us and your social media community. 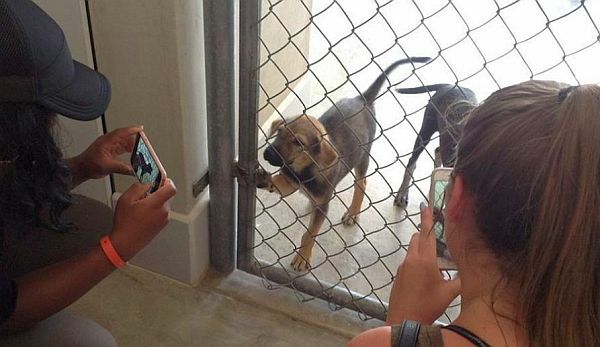 Your photos and videos can help dogs and cats find their forever homes. Puerto Vallarta, Mexico - Ordinary people come to Puerto Vallarta to vacation. Extraordinary people come to Vallarta and volunteer! Spend a rewarding afternoon cuddling with the animals at Puerto Vallarta's SPCA Sanctuary. Our dogs and cats are awaiting "forever homes," and your help is needed to jump start their socialization. The goal is to get these animals adjusted and ready to interact in the real world. The majority of the SPCA animals either come from extremely abusive situations or they have been abandoned. Your love and attention can make up for that lost time. During your visit, you can interact with the animals and even take a dog (or two or three) for a walk. You can also play with the animals, assist the vet or help with dinner time. There are so many positive benefits when you decide to volunteer. No matter the amount of time and effort you share, it's always returned to you in multiple ways. Enjoy the satisfaction of helping others, increased self-esteem, lower blood pressure and meeting new people. If you have children, this is a great opportunity to teach them how to work with animals, respect others and give back to the community. Volunteering builds a child's confidence, brings them a sense of achievement and offers a unique experience in another country making for the best "What I did on My Mexican Vacation" report. Create lifelong memories by sharing just a few hours of your time with the dogs and cats of the SPCA. Your act of kindness will mean the world to these lovable, furry creatures. So, you're ready to get involved? Every Tuesday and Thursday (Note, days subject to change) we get a group of people together and we travel to our SPCA Sanctuary. Please contact Tina at spcapv(at)gmail.com to make a reservation. Pack your bag for an amazing afternoon at the SPCA! Please bring water, a sack lunch and any treats you might enjoy during your visit. Sharing food with the animals is prohibited, but our vet and Sanctuary staff might enjoy an extra treat! We encourage you to bring your camera. Take as many photos as you'd like, and share them with us and your social media community. Your photos and videos can help these dogs and cats find their forever homes with people who will treat them with the love and care they deserve. Want to make a donation? The SPCA Sanctuary runs strictly on donations, and our animals are in great need of the following items: towels, leashes, collars, dog and cat toys, animal beds, carriers and sweaters. If you cannot deliver the items to the Sanctuary, please contact us and we will schedule a drop off. Get involved... rescue, adopt, foster, volunteer, donate or educate. Contact us at spcapv(at)gmail.com. You can learn more about the SPCA Puerto Vallarta by checking us out at spcapv.com, or on Facebook. About the SPCA de PV: The mission of SPCA de PV is to help fund and promote sterilization, adoption and health care efforts for companion animals in the Puerto Vallarta area, with the goal of eliminating the euthanasia of healthy and adoptable animals. In January 2012 they opened a sanctuary on the outskirts of town. It is a no-kill shelter and can house up to 130 animals at once. The people at the shelter are devoted to the animal's physical and emotional rehabilitation and everyone is invite to come out and interact with the animals. A registered 501(c)(3) charity, donations are tax deductible in the US. Learn more at SPCAPV.com.